This innovative Joy-Con controller lets you add more players to your Nintendo Switch games. The right controller features a touch point for your Amiibo figurines; both feature integral motion control. Attach them to your console, use them together, or use one for each player in compatible games. Great product for big families and wanting games with 4 players. Joy-cons however are quite small and require getting used to. The + remote is a bit less comfortable than the - remote when playing games requiring the ZR and ZL buttons. Awesome much cheaper than buying in store. Didn't realise the controller colours are opposite the original controllers. Ie. right is blue and left red. What a bonus! Exactly as shown. Just what I wanted. 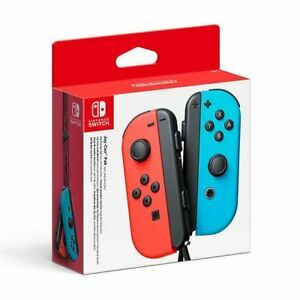 Is the red joycon on the left side or the right side same with the blue?